Partner Teresa Alarcon was recently asked about her experiences with the development of associate talent at large law firms and how it informs her current leadership approach. The full text of the article can be found by subscribers here. Partner Nannina offered her thoughts on the issue of employee health monitoring in a recent Human Resources Executive article. See the full text here. Basing her comments on client experience, Partner Nannina Angioni was quoted on the issue of sexual harassment in the workplace and what would make some plaintiffs hesitant to bring a lawsuit. Her insights, and the article in its entirety, can be found here. Partner Nannina Angioni provided comments for an article detailing the legal issues raised by the ongoing Brian Williams misrepresentation saga. To read the full article, including Angioni’s comments, click here. National Law Journal: Reporter Amanda Bronstad provided a great introduction and highlighted the role women play on the current legal industry stage. The full text of the article is available here. Law360: Reporter Kat Greene issued a thorough overview of our firm goals and direction. The full text is available to subscribers here. Daily Journal: Reporter Deirdre Newman interviewed founding partner Nannina Angioni and reflected on the female leadership in the legal industry. The full text is available on the Daily Journal website, for subscribers, here. Los Angeles, CA – KAEDIAN LLP, a Southern California based law firm, today announced its official launch. The new law firm is a collaboration between longtime colleagues Nannina Angioni, Katherine “Kacey” McBroom and Teresa Alarcón and will focus on General Business Litigation, White Collar Criminal Defense & Investigations, Labor and Employment Litigation and Compliance, and General Criminal Defense. The founding partners seek to combine depth of experience and training with a diverse service offering to meet the needs of clients throughout California and Nevada. The firm will officially open its doors today after weeks of organizational planning and following an early December departure announcement from all three women at former firm Brown, White & Newhouse LLP. 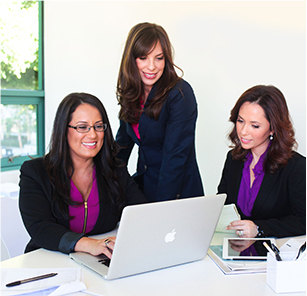 KAEDIAN LLP has offices in Los Angeles and Newport Beach and a satellite office in Las Vegas, Nevada. The choice of Las Vegas for the satellite resulted from an observation all the partners have made that many of KADEAN LLP’s existing clients either have or plan to have a presence there and, as part of being a full-service firm, offering this infrastructure therefore seemed a logical step. Notable for having an all-female leadership structure in a time when women comprise only 21% of partnerships nationwide, all three KAEDIAN LLP partners bring impressive and very different credentials to the new firm, with combined decades of experience in their respective areas. Partner Teresa Alarcón will focus her practice on white-collar criminal defense and related civil litigation while dividing her time between the firm’s Los Angeles and Orange County offices. Her defense experience includes Foreign and Corrupt Practices Act and commercial bribery investigations and prosecutions, environmental crimes, public corruption, campaign finance improprieties, contract disputes, SEC regulatory agency enforcement actions, internal investigations, grand jury proceedings and federal appeals. Prior to joining Brown, White & Newhouse LLP, Alarcón was an associate with both Bienert, Miller Katzman PLC and Am Law 100 firm Sheppard, Mullin Richter Hampton LLP. Partner Nannina Angioni will head the Labor & Employment and General Civil Litigation practice groups for KAEDIAN LLP, bringing to the table extensive experience as an advocate for companies, entrepreneurs and management in all areas of state and federal litigation, administrative proceedings, and business and employment relations, including human resources and disciplinary guidance, management and staff training and internal investigations aimed at litigation prevention and mitigation. She served as a partner with Brown, White & Newhouse LLP prior to forming KAEDIAN LLP, where she managed an active civil litigation practice. Admitted to practice in both California and Nevada, Angioni will be an essential component for developing the firm’s Las Vegas office. Partner Kacey McBroom has many years of white collar and general criminal experience under her belt, having handled everything from DUIs to grand theft and attempted murder cases to a white collar criminal defense practice that has included securities issues, insider trading, numerous types of fraud across several industry sectors, obstruction of justice and RICO violations. McBroom has also handled the civil aspects of her criminal cases in multiple matters and is particularly adept at balancing the two separate tracks when needed. Prior to her time with Brown, White and Newhouse LLP, she was a Deputy Public Defender, an associate with The Law Offices of Randolph and Associates as well as a law clerk to noted criminal defense attorney Gigi Gordon. KAEDIAN LLP plans to commemorate their launch with a celebratory event for friends and clients in the spring. In the meantime, they are already hard at work on incoming matters. KAEDIAN LLP is a Southern California law firm focused on resolving disputes in the areas of General Business Litigation, White Collar Crime & Investigations, Labor & Employment Litigation and Compliance, and General Criminal Defense. The firm was formed with the principle that successful conflict resolution depends on having well-trained, creative and strategically-minded advocates. KAEDIAN LLP has offices in Los Angeles, Newport Beach and Las Vegas, Nevada with attorneys licensed to practice in both California and Nevada. More information about the firm can be found at www.kaedianllp.com. We will consistently update this page with firm news, events, and updates. Please check back often for more information about our firm and activities.